The Black Margate are found in large shoals and can be fished in April with much success. It is also known as zapatero, or shoe maker, in Spanish. April is when the Black Margate form in huge shoals in depths ranging from 30 to 90 east of the reef. 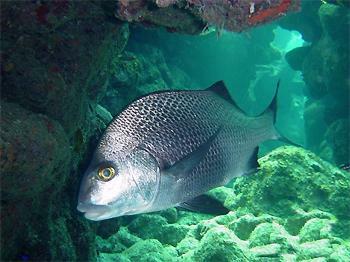 During April, Black Margate can be seen in massive schools when diving in places such as the Hol Chan Marine Reserve. Black Margate can weigh over ten pounds, but usually average between three and eight pounds. Locally, Black Margate caught in abundance while drifting or at anchor in 30 to 90 feet of water. During February to April, Black Margate spawn in huge shoals. Black Margate feed on small lobster, shrimp and other crustaceans. I usually fish these schools by chumming the water with conch bits for a few minutes before dropping a ½ ounce weight baited with a number one hook with the organ part of the conch. As long as you are over the spawn, you will continue to pull in these fish. Old timers who used to commercially fish this species talk of filling their boats with Black Margate. 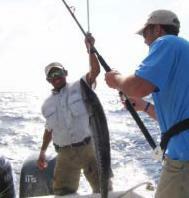 Since the fishing fleets of days gone by on San Pedro these techniques have largely been lost, however a new breed of fisherman, sport fisherman armed with sophisticated echo locators and local lore are now hunting this species in waters offshore of Ambergris Caye. Fishing spawning Black Margate is like wielding a double edged machete against a pile of coconuts because under the schools of Black Margate lay large feeding grouper, shark and barracuda. Usually, after I have caught enough Black Margate to feed my guest, I’ll drop on a heavier weight and fish mullet and sardines below the deepest depth that the Margate were caught, in hopes of snagging one of these lurking behemoths. Black Margate is a fun fish to hunt and catch, and a great fish to eat. With luck you will soon get a bite of this tasty species on your next spring time fishing expedition in Ambergris Caye.